I am glad I saw Super 8. As the first half of the film filled a gap in my film history that everyone else seems to have had filled by The Goonies. I have to be careful here as The Goonies seems to be a bit of a sacred cow. Unfortunately the faux manufactured nostalgia of the ropey tale of a bunch of dopey kids running around from one set up to another always seemed more farcical than adventurous high jinks to me and is completely lost on me. Give me the exploits of Snake Plissken any day of the week. Sure The Explorers and Stand by Me came close and I was left with The Lost Boys and Fright Night but the first half of Super 8 has finally taken care of the hole where I needed a semi intelligent pre-teen adventure to reflect upon. 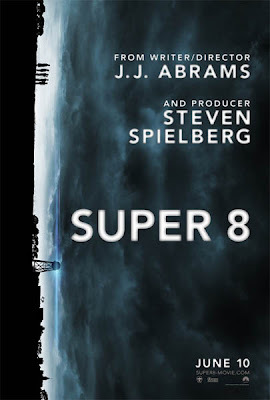 I had high expectations for Super 8 the film that J.J. Abrams made after the astonishing Star Trek reboot. I’m not the biggest J.J. Abrams and apart from Star Trek, his hands on involvement in the first 6 episodes of LOST and Cloverfield, feel that his work lack something they have very flash wrapping paper and ribbons but there is very little in the box. So when I heard that Abrams was teaming up with Steven Spielberg various scenarios played out; would Spielberg's influence pull Abrams to a more mainstream kids feature or would Abrams push Spielberg to a more edgy place? Bear with me while I take another sacred cow to task, everyone knows Spielberg adult themed films are mostly close to faultless, his narrative style pervades modern film and has become the by the numbers play book for many filmmakers - but his recent kids films seem to be just that, films aimed squarely at kids. So what would the dynamics of the Abrams - Spielberg relationship offer up? But as I sat down to watch Super 8 none of that mattered it was tabula rasa as I got my expectation free movie watching zone. Spielberg’s Amblin logo pops up in its partially faded electro blue and red it nostalgically reminds me of Spielberg’s legacy of magic. As Super 8 starts Abrams is quick to set the scene; small town America sometime in the late 70s and he immediately applies a Spielberg golden rule as we are emotionally drawn into the family lives of a circle of young friends and most specifically Joe Lamb (Joel Courtney) who is the son of conservative town Deputy Jackson Lamb (Kyle Chandler) and they have recently suffered a family loss. The story plays out intriguingly and steeped in emotional nostalgia as we get to know the bunch of friends, the group dynamics, their families, local secrets and their personalities as they waiver between charming and annoying as kids this age are. Every circle of friends needs a quest and bunch are attempting to make a short super 8 zombie flick called The Case (stay as the credits roll). Late one evening while trying to finish filming a scene of The Case the bunch are interrupted by a train crash. A disaster that unleashes a terror that sets about turning their world and town upside down. In fact I would go so far as to say that this is the most engaging portrayal of this kind friendship and I buy into it a lot easier than the many other films that have tried to capture this exploratory time of life and foibles of the youth. Despite its high production values and engaging story roll out the second half of Super 8 does slide slightly into a by the numbers creature feature as the action kicks off and the explosive destruction switch is turned all the way up, as a young boy finds his heart and his way. Borrowing heavily from the Spielberg visual lexicon and play book of techniques like; not seeing the beast whilst they hold the increasingly panicky town hostage, bad things happen to bad people, the authorities are just as much a threat as they invade the town with their own agenda, drugs are for wasters, understanding is the key to communication and although there are monsters the story has its emotional heart in the relationships between the characters, as well as many more subtle references. I loved the overhead shot of a model train, classic Spielberg as well referencing an in film story. As with Nick Frost & Simon Pegg’s Paul, Super 8 is homage to the films genre roots to films like; Close Encounters of the Third Kind, Jaws, The Thing, Alien, Slumber Party Massacre , Scanners, E.T. The Extra-Terrestrial and although J.J. Abrams hasn't mentioned it Invaders from Mars, it is more of a tribute to Spielberg himself. Regular trademark Abrams references like Slusho! make an appearance as well as the beast itself is very much of the Cloverfield breed, in fact on its first proper appearance I assumed the beast was actually related to the Cloverfield monster and Super 8 was a prequel. I found the ending a little saccharine for my taste but throughout Super 8 is class filmmaking and there are enough scares to keep anyone entertained as the young guy who sat next to me during the screening can attest by his crawling up his seat and then trying to hide in it at various stages of the film. Super 8 is classic kids Saturday matinee entertainment.